Home Archive by Category "Incident Report"
This document presents the major reported antisemitic incidents between August 2015 and Mid-October 2015 in Europe. 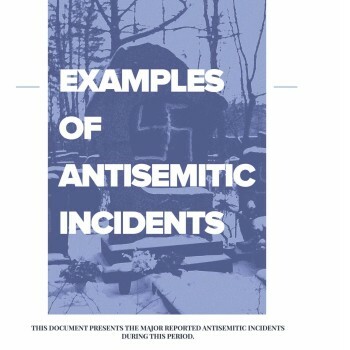 Prepared by the European Jewish Congress, Member of the Advisory Board of the European Parliament Working Group on Antisemitism. 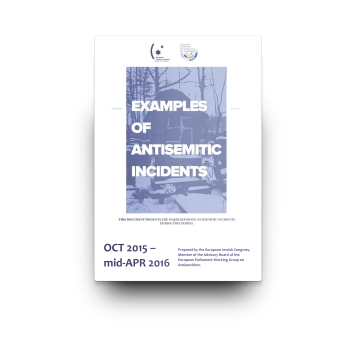 This document presents the major reported antisemitic incidents between April and July 2015 in Europe. Prepared by the European Jewish Congress, Member of the Advisory Board of the European Parliament Working Group on Antisemitism. 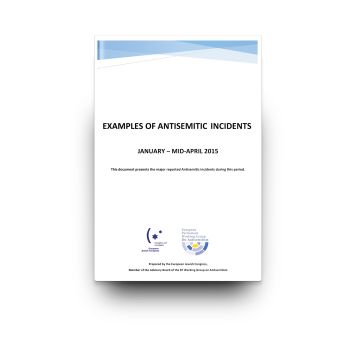 This document presents the major reported antisemitic incidents between January and April 2015 in Europe. Prepared by the European Jewish Congress, Member of the Advisory Board of the European Parliament Working Group on Antisemitism. This document presents the major reported antisemitic incidents between November 2014 and January 2015 in Europe. 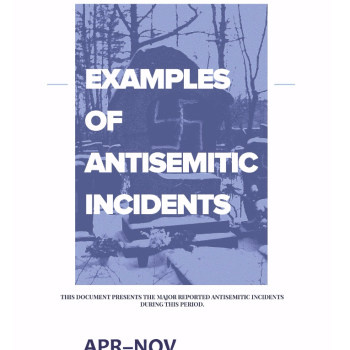 Prepared by the European Jewish Congress, Member of the Advisory Board of the European Parliament Working Group on Antisemitism. 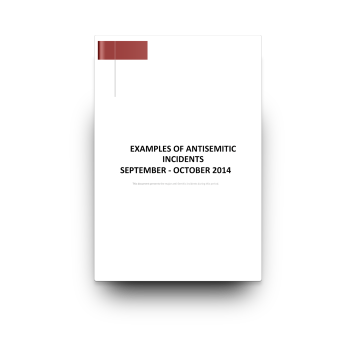 This document presents the major reported antisemitic incidents between September and October 2014 in Europe. Prepared by the European Jewish Congress, Member of the Advisory Board of the European Parliament Working Group on Antisemitism. This document presents the major reported antisemitic incidents between May and September 2014 in Europe. Prepared by the European Jewish Congress, Member of the Advisory Board of the European Parliament Working Group on Antisemitism. This document presents the major reported antisemitic incidents between May 2013 and April 2014 in Europe. Prepared by the European Jewish Congress, Member of the Advisory Board of the European Parliament Working Group on Antisemitism.